Find coverage of the latest technology trends and science breakthroughs & discoveries here at Tech Powers. Blog Use Of Tech in Lawn Care: HOW TO DO IT? Use Of Tech in Lawn Care: HOW TO DO IT? 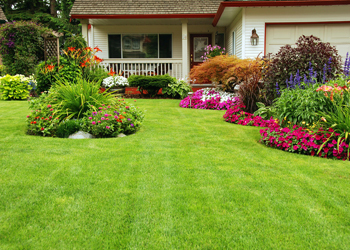 Before you even maintain your lawn, you must already have one! If, on the other hand, you already have a garden with a lawn, know that this step is not useless and may be interesting to reseed areas of your garden where the grass is not as bushy, or particularly hard to push. Clean your land. Check the condition of your property, then remove pebbles, roots and grasses already present, which may stifle or damage your lawn. To do this, you can plow on 30cm, which will give you a deep enough depth to ensure you reach the roots and deep plants. To take care of the clods. The soil will only very rarely be homogeneous and flat, but this is important for the ideal growth of your lawn & garden. So try to level the soil after scraping the ground to eliminate the last pockets of weeds. Use a roller to tamp the soil, which will prevent the seeds from sinking too deep into the soil. Sow the seeds. Not all lawns are the same, so it depends on what type of turf you want (like a sports field, or just a residential lawn). Spread 30 grams per square meter, then roll one last time so that the seeds mix properly with the soil and do not stay artificially on the surface. Water in fine, scattered rain. Using a garden hose type Karcher, set the dispersion on cloud format (very scattered rain). This will help to water your land, while avoiding that the seeds are taken away elsewhere because of the flows. Water enough ... If you water only superficially, the water will stay on the surface and will not reach the roots. It will be drunk by the earth, but will not be in sufficient quantities to go down to the depths. You will then lose a certain amount of water, which will have time to evaporate before being drunk. But do not water too much! If you are afraid that the water will not reach the depths and the roots, do not worry: do not forget that the earth drinks, and so your water will go to the depths. When you notice that the water begins to stagnate a little longer on the surface, it means that the soil is already well gorged. In this case, you can stop watering: a surplus of watering will bring nothing, and could risk drowning the roots. The increase in humidity is also conducive to the appearance of fungi. Observe the weather conditions. It would be a shame if you started watering your entire garden while a thunderstorm is brewing in the next few hours, because in addition to drowning your garden, it will increase the humidity even further. On the other hand, if the days are very hot, prefer to water in the morning or evening, once the sun has set. Watering during periods of high heat, it is indeed create significant losses via evaporation, and the waste of a valuable resource. Invest in automatic watering with detection. If you do not have time to water or your land is large enough, such a device is of interest. Try to choose one that can analyze the humidification and hydration of your soil. In this way, it will automatically adjust to trigger watering as soon as the soil is dry. You can also choose with programming functions to water during the night during periods of high temperatures. The passage of the mower is of course an imperative of the maintenance of the lawn. But making a perfect mowing is not always easy when you do not have good yard tips in mind. Here they are for you! Select your lawn mower. If you own a mulching mower, it will allow you to not pick up the plant debris because they will be cut very finely and will remain on the spot. If this is an excellent fertilizer and natural fertilizer, consider alternating with a conventional lawnmower to avoid the appearance of fungi, because of soil moisture. Clean your land. The blade and the mower deck will be in direct contact with the ground, so it is important that you remove any solid parts that could damage the mower, such as pebbles and other dead branches. If you're a pet, this is also an opportunity to remove any feces and toys lying around! Start with the outlines. In your garden, first go around obstacles and contours: this will allow you to visually define the limits not to exceed, to prevent your lawn mower accidentally attack a tree, a parterre flowers or a bush. Proceed in a crossover fashion. Starting, at your option, in length or width, cover the entire surface in this way. If you started in length, redo the same width, and vice versa. This double process will allow you to make sure the whole lawn is covered by mowing. The use of a scarifier will allow to clean your ground, perfect the finishes and allow him to leave in good health! Remember to follow the following steps to do this thorough job with the utmost efficiency. Prepare the scarification. You must first put your land in condition; 1 or 2 days before you pass the scarifier, water your lawn. A cool and wet lawn will facilitate scarification . Also remember to mow the lawn and pick up the cuts so they do not interfere during scarification. Perform the scarification. According to individuals, not everyone will scar the entire surface of their lawn; some will be content with angles and edges, while others will want to take care of their entire garden. In this last perspective, scarify the lawn and garden over all its extent, by cross crossing over the damaged areas. Insist if you detect the presence of moss and weeds, which are thoroughly removed by the scarifier. Clean the ground. Using a lawn mower, or simply a rake, scrape the soil to finish the job and destroy the last pockets of roots and weeds still existing. If you have a compost that you can use as fertilizer or natural fertilizer, it's a good time to put them down! Water one last time. Treat sparse areas. Depending on the pH of the land, and other conditions, some areas of your lawn & garden will grow less well than others, or seeds may have taken root less well. Perform a reline sowing following the same steps as in step 1. What would be worth the maintenance of a garden center if your tools were not up to par? This is particularly the case for machines, such as the scarifier or mower, which can quickly lose performance if you do not maintain them. For the mower, first start sharpening the blade. Then clean the housing with a high pressure cleaner to remove any adhered or stuck items. Then, attack the engine space by draining the engine oil. Replace with clean oil, then check the air filter. If it is dirty, clean it, but if it is attacked, consider changing it. Finally, lubricate the cables with oil, then press the handles several times so that the oil diffuses well everywhere. You can also find more lawn and garden equipment by visiting our website The Smart Home Improvement.